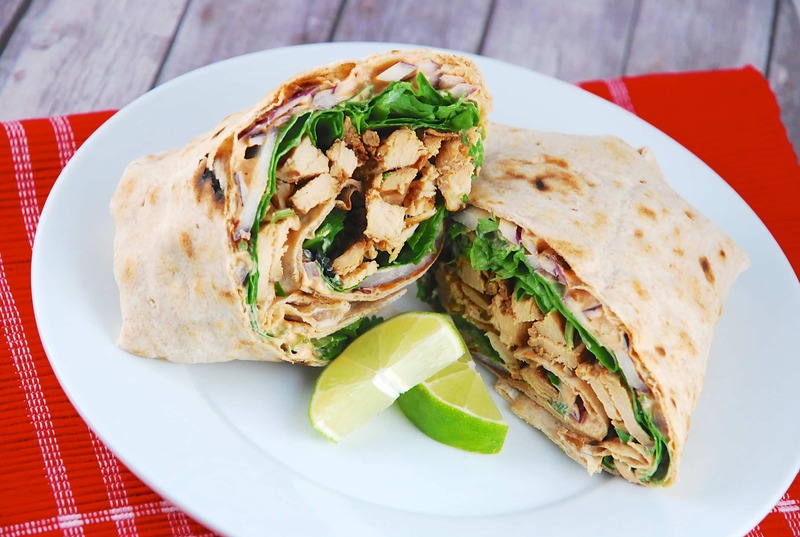 This Chipotle Chicken Wrap Recipe is one of my favorite Weight Watchers lunch recipes. Not only is it a very nicely sized serving and very filling, but it is mouthwateringly good! The heat and smoky spice of the chipotle peppers is cooled a bit with the tangy Greek yogurt. This sauce is combined with the cooked chicken breast and fresh vegetables condiments and it all comes together to create a flavorful, light wrap that is amazingly good and can be prepared super quickly. If you have leftover chicken, this is an ideal recipe. Spicy, tangy, smoky, and incredibly filling, this Chipotle Chicken Wrap is one of my favorite Weight Watchers lunch recipes. It’s quick & easy to make, and the flavor combination is positively mouthwatering. In a small bowl, combine yogurt, chipotle peppers, and lime juice until well blended. Spread 1/2 of the yogurt mixture onto a lavash wrap. Add 1/2 of the chicken, lettuce, red onions, cilantro. Fold wrap in at the sides and roll up. Repeat with remaining wrap. Cut both in half and serve. Hello, Im new to these wrap ideas they sound good and super easy and light for the summer and work week. I want to ask is it better to use chicken that has cooled down after cooking or while its still warm when putting the wraps together. Any pointers will be great. Thanks!! This wrap looks amazing and the ingredients tell me that it tastes DELICIOUS! I can’t wait to try!! And I’d love to feature it on our website, Land of Nosh. Would you email me so I can tell you about the details? info [at] land-of-nosh [dot] com Thanks!! Greek Yoghurt is prohibitively expensive where I live. Is there anything else I can use as a substitute? Yes, you can use sour cream in it’s place. Though it may affect the Points Plus value…..so you’ll have to double-check the nutritional stats when you make it. Can’t eat spinach but it’s not a biggie.